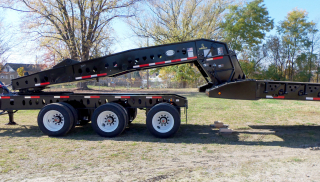 The ROGERS CobraNeck 90-ton modular trailer epitomizes versatility in the specialized heavy-haul trailer market. 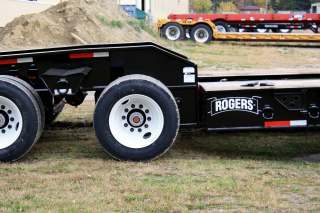 Shown as a 3 + 3 + 2 configuration with a 28'-0" long x 10'-0" wide platform deck, detachable tri-axle rear bogie, Nitro-Stinger, removable 4th & 5th axles and a 45-ton tri-axle jeep dolly. 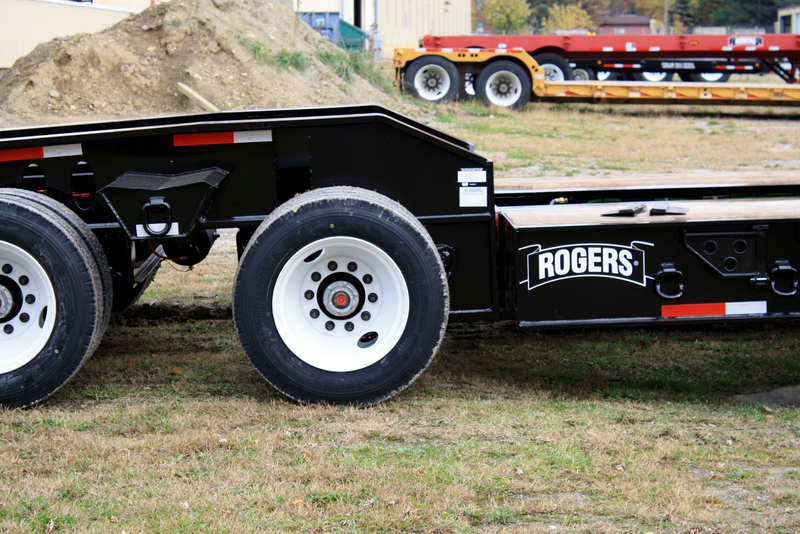 The capacity of the trailer in this configuration is 70-tons in 12'-0" of the deck in a 2-point load. 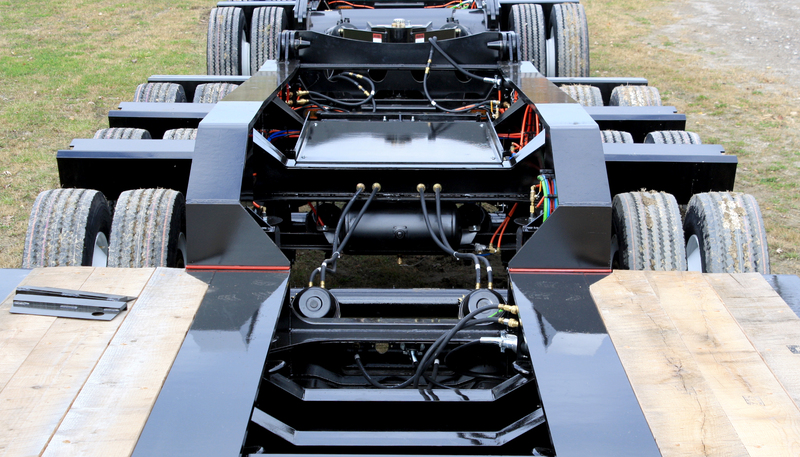 Close-coupled (without the Nitro-Stinger) the trailer capacity is 90-tons in 16'-0" of the deck in a 2-point load. (4) additional bent lashing D's, (2) each side of "Bucket Pocket"
The CobraNeck gooseneck provides easy and efficient operation. 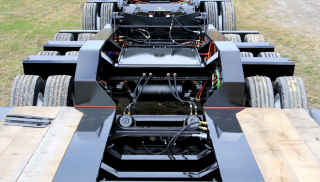 Fifth wheel heights and/or deck heights are easily changed using the "rack and pawl" adjustment on the gooseneck. 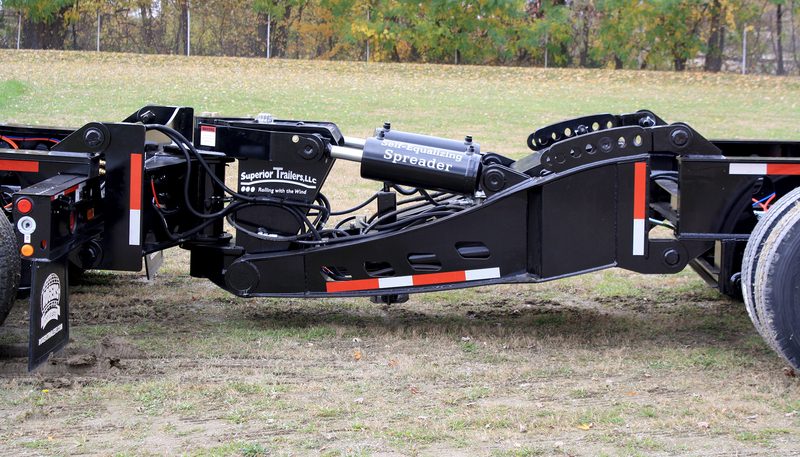 When needed, the gooseneck can be raised in order to provide additional ground clearance. Dual-arm hydraulic gooseneck jack with shoe provides stable support of the gooseneck to the truck or jeep dolly frame when the gooseneck is detached for loading or unloading. The "pin and paddle" style detachable rear is extremely durable and easy to operate. This type of connection not only allows different decks to be used with the trailer (i.e. a drop side deck or an I-beam deck, but also allows deck extensions to be used for additional length. 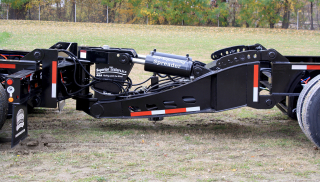 The optional Nitro-Stinger (a type of booster axle assembly) not only satisfies the spread axle permit requirements of many states but provides constant weight distribution to the rear axles. 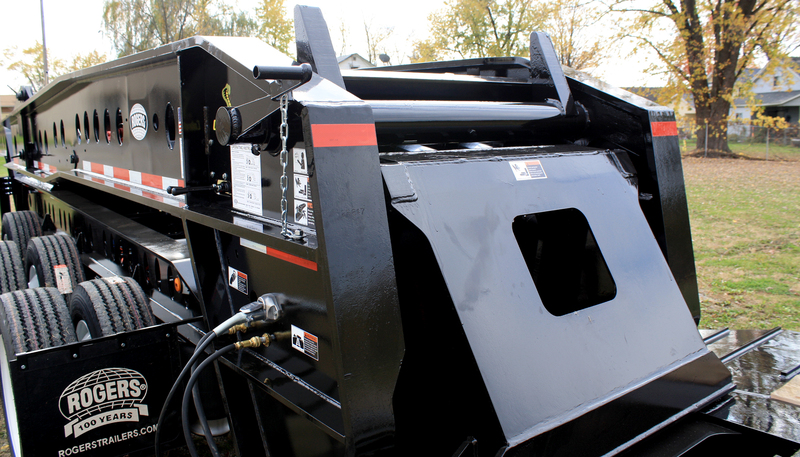 A knuckle assembly in the booster frame assists in the trailer's maneuverability while moving forward. The knuckle can be locked in place and the rear axles raised hydraulically to assist in moving the trailer in reverse. Cross members in the rear of the deck are lowered to form a "Bucket Pocket" while cross members in the rear frame form a "Boom Trough" to give additional overhead clearance when hauling certain types of machines, especially excavators.